This is the fourth in a series of posts that focuses on the Sundays of Great Lent (and Holy Week and Pascha). Each week we will share ideas of ways to help your Sunday Church School students learn more about that particular Sunday’s focus. We will share each blog early, so that you have time to read it before the forthcoming Sunday, in case you find any of those ideas helpful for your particular class. On this second Sunday of Great Lent, we commemorate St. Gregory of Palamas’ successful defense of the Orthodox belief that humans can both know and experience God. He asserted that we can know with our minds that God exists, and we can also experience Him through His uncreated energies. This flew in the face of the teachings of Barlaam, a critic of St. Gregory’s and of Hesychasm in general. St. Gregory was born in 1296 to a prominent family in Constantinople. His father died when Gregory was still young. The youth was so bright and hardworking that the emperor himself took interest in Gregory, helping to raise and educate him in the hopes that he would one day hold a high government position. In 1326, Gregory went to Thessalonica and was ordained to the priesthood. He lived the life of a hermit on weekdays, silently praying alone and away from the world. On the weekends, he would celebrate the holy services in his parish and he would preach so beautifully that his sermons brought his listeners to tears. When Barlaam, a bright and studious monk, came to Mt. Athos and heard about hesychasm, he proclaimed it to be heresy. He insisted that it is not possible for humans to know God’s essence or to experience His energies such as uncreated light. His dissent caused quite a stir, and Gregory was called to debate with Barlaam about this. Gregory’s studies in the world and his experience as a hesychast put him in the perfect position for this debate. Gregory first tried to speak to Barlaam about all of this, but speaking did not seem to make any progress, so he began to write prolifically about the prayer of the heart and its validity. Although Gregory was writing a lot, they continued to meet and debate in person as well. One of these debates was before the 1341 Council of Constantinople, which took place in Hagia Sophia. This time, they were arguing about the Transfiguration. Gregory stood by the Orthodox belief that God revealed Himself to the disciples on Mt. Tabor, by using His Divine Energies. Barlaam said theirs was not an actual experience of God: just a helpful gift to the disciples, who couldn’t really experience God because they are humans. The members of the Council upheld Gregory’s position as the truly Orthodox position. They agreed that God, Whose Essence we cannot approach, chooses to reveal Himself through His Energies. Humans can see those Energies, such as the light that the disciples could see on Mt. Tabor. After the Council ruled that Barlaam’s teachings were heresy, Barlaam fled to Calabria. Thanks to St. Gregory Palamas, the Church has maintained the truth that we humans are able to experience God through His uncreated energies. St. Gregory’s life of dedication to God and His Church, as well as his willingness to stand for truth set him apart as a wonderful example to all of us. 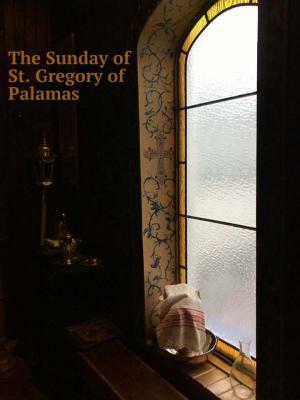 Sometimes people refer to the Sunday of St. Gregory of Palamas as “The Sunday of Orthodoxy Part Two,” since his defense saved the Orthodox Church when it was under a second major attack. The Gospel reading for this second Sunday of Lent is the story of the paralytic whose four friends lowered him through the roof of the place where Christ was so that he could be healed by Him. Our Lord not only healed his legs, making him able to walk again, but also healed his sins, telling him, “Your sins are forgiven you.” How beautiful it is for us to be reminded, right here near the beginning of Great Lent, that the truth of our Faith is worth standing up for, as did St. Gregory; at the same time receiving the reassurance that Christ is waiting for us to come to Him so that He can heal both our soul and our body. St. Gregory of Palamas, please intercede for us and for our salvation! Here are printable bulletins for children that talk about today’s Gospel reading and offer a short look at St. Gregory of Palamas. Although they are not dated for this year, they could help in a lesson on St. Gregory of Palamas (and/or the Gospel reading of the day). This episode of the “Tending the Garden of Our Hearts” podcast tells about St. Gregory of Palamas, and is worded in a way that young children can understand. Teachers of middle-years students may want to watch this with their students as part of a discussion of the life of St. Gregory Palamas, then discuss it together. Teachers of older church school students may wish to take in one of the resources mentioned here, along with their class, as part of a lesson on St. Gregory of Palamas. After watching or reading one of these resources about his life, talk together about St. Gregory’s holiness, including a discussion of hesychasm. What is hesychasm, anyway? What can it look like for us? How can we ask God to enlighten our darkness, as did St. Gregory? What will happen if we ask Him to do that? Will it make any difference in our life? (An aside that the students may find very interesting is a quick look at uncreated light, as it appears in some pictures or videos wherein God chooses to illumine people in a way that perhaps no one can see at the time, but it shows in the photos. There’s a video posted by a priest about uncreated light that shows three different times/ways this has happened.